We have developed a novel, fast, and low cost protocol for isolating extracellular RNA and proteins from urine that gives a higher yield than current commercial kits. Furthermore, we have written a novel bioinformatics protocol that mines high-throughput sequencing data for known and novel disease-linked miRNAs. We are using our extracellular vesicle isolation protocol and our bioinformatics protocol to find biomarkers for prostate and bladder cancer. You can buy our kits here. Ymir Genomics provides new tools to facilitate the discovery of biomarkers from biofluids. Using these tools, we have discovered novel biomarkers to fight human disease. 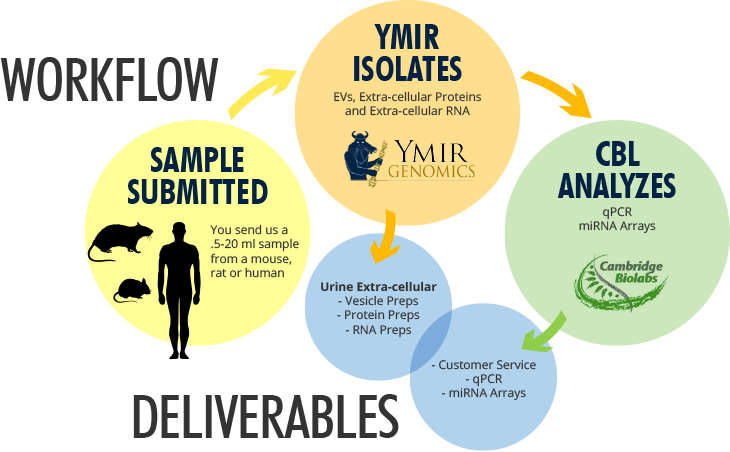 Ymir Genomics LLC has developed a novel, rapid, and efficient method for isolating extracellular Vesicles, extracellular RNA, and/or extracellular protein from urine samples. This method’s yield is superior to other methods, including Ultra-centrifugation, for isolating biomarkers from most urine samples, especially the more dilute urine samples. Now Ymir Genomics is teaming up with the highly regarded contract research organization, Cambridge Biolabs (CBL), to offer a unique service to researchers in the urine biomarker discovery field. You simply send us urine samples from your rat, mouse, or human studies. We then can isolate extracellular vesicles preps, extracellular protein preps suitable for proteomics, or extracellular RNA preps suitable for transcriptomics. These preps can be sent back to you or given to CBL for qPCR studies for specific RNA species or microRNA array studies. Copyright © Ymir Genomics LLC. All Rights Reserved.